Self-publishing success stories are so rare they may as well be urban legend. Three years ago, whilst working for a science fiction magazine, I decided to take a break from my usual acerbic rants about film dystopias to do a book review. As a strong sympathiser with struggling writers, I chose someone for whom success was still around yet another corner: someone self-published. Matthew Mather had uploaded his novel Atopia to the Kindle store, and I found it to be an enjoyable and imaginative first work. Atopia was the only review I ever did for the magazine, but it turned out to be quite a choice—since then Montreal-based Mather has become something of a name in science fiction. His second novel Cyberstorm has been translated into sixteen languages, with the global bestseller currently being made into a Hollywood film. 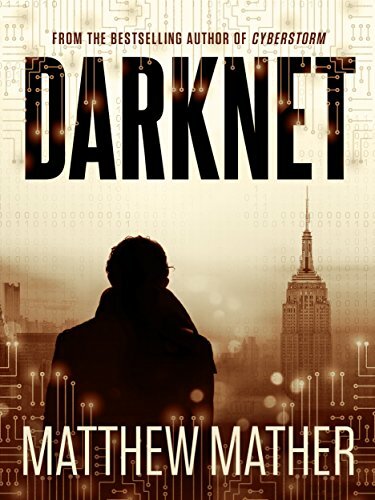 Even though my reviews of these two novels weren't wholly positive—praising the plot but criticising the characters—Mather emailed me offering an advance copy of his latest novel, Darknet, an offer I enthusiastically accepted. Darknet follows Jake, a stockbroker with a happy hetero marriage who lives in an expensive Manhattan apartment with his wife and child. Jake (whose life, from my doggedly leftist perspective, is the living embodiment of everything wrong with the world) soon finds himself at the centre of a global conspiracy involving an artificial intelligence bent on ravaging the planet like an angry toddler. Death and terror ensue. I have to confess, based on the description alone I would have been unlikely to read Darknet—rogue AIs are so well-trodden in the world of science fiction they've formed a smooth, metallic flooring. Yet the hook for Mather's works comes from his background in the tech sector. So whilst it does feature all the usual chicanery from an inhuman intelligence, it also weaves in a host of other recent technologies, each interacting with one another in unique (and often rather horrifying) ways. It is in havoc that Mather is at his strongest, combining his knowledge of current and near-future technologies with a strong—and often frightening—imagination. In broadly the same vein as the UK's Black Mirror television series, Darknet considers the worst-case scenario when it comes to various technological advancements, and Jake falls victim to a whole host of them, from stalking via facial recognition software to identity thefts capable of fooling close family members. The research behind the novel is self-evident, and though the technological disasters unleashed by the rogue intelligence are extreme, they never slip into melodrama or farce. In fact, Darknet's strengths come from its taking what are popularly considered to be decentralised (and thus anti-authoritarian) technologies, and demonstrating their potential for the exact opposite if properly co-ordinated: innocent crowdfunding thus becomes an opportunity to create "assassin's markets" to kill dissenters; virtual currencies allow for corporate entities to fund nefarious activities anonymously; and automated AIs lead to the establishment of "virtual corporations"—electronic businesses which are entirely free of human oversight, bestowing on them even less of an ethical and moral code than they had before. So far, so cyberpunk. But it doesn't take place in a distant, polluted dystopia—in fact, the novel's twenty-minutes-into-the-future setting gives it an uncomfortable plausibility. Everything featured in Darknet is possible with current technologies. For those of us whose misspent teenage years were dominated by Orwell and Huxley, alongside the ever-fluffy and upbeat Star Trek, among the most important aspects of a work of science fiction are its political and social messages. Am I reading a right-on Ursula Le Guin, or a ranting Robert A. Heinlein? What exactly are Mather's political themes, considering his main protagonist is an individual whose wealth is derived from the suffering of others? Can a novel featuring the worst of Wall Street deliver a palatable message? In this context, the progressive undertones of Mather's dark worst-case scenarios prove both provocative and satisfying. As with his previous works, Mather's message is aggressively anti-authoritarian, seeing unregulated global businesses and corrupt governments alike working (often unwittingly) to unleash horrifyingly creative modes of destruction on the world. At the heart of Darknet lies the ultimate amorality of global capital. The ravages of global finance aren't down to an evil and corrupt mastermind, merely a system which reduces the real world into a series of fiscal advantages. The novel's villainous organisation may do evil, but the evil is thoughtless and unplanned, and all the more frightening for it. The novel is unconcerned about whether villainous organisations are in public or private hands, simply suggesting that, without accountability and oversight, institutions are capable of wreaking considerable havoc. As such, Darknet is as much a futurist morality tale as it is a thriller. In keeping with the novel's liberal undertones, the characterisations are fairly progressive: whilst the aforementioned protagonist is an obligatory white U.S. American male, a pivotal role is taken by a Chinese woman, "Jin," and her chapters really held my attention. Call me a politically correct brainwashed megaqueer if you want (in fact, please do), but I couldn't help rooting more strongly for the Asian woman than the white male. Her realistic, human vulnerabilities make her acts of bravery compelling, and her fear at being drawn into the novel's deadly events make her relatable. Unfortunately, this actually highlights a significant problem: her chapters engaged me more than the main protagonist's. Jake is your typical "everyman" figure—and alas quite bland. Despite the novel's critique of global finance, Jake's economic privilege is never truly called into question, and in contrast to Jin, he is too calm, and too rational. His wealth, resourcefulness, and competence prove alienating—his only emotional wobble comes later, upon the kidnapping of his infant daughter, and then we're treated to the standard masculine rage. This limited emotional range gives him far too much in common with his unfeeling AI nemesis. Sadly, Jake is not alone. Whereas the novel's strengths lie in its plot and darker sci-fi schemes, its weaknesses lie in its characters: the majority of the figures in the novel are never fully expanded upon. There are so many of them for such a short work that they wind up crowding the reader, who will inevitably confuse the unnecessary herd of personalities and wind up backtracking just to keep track of who's who. It's like being at a party with very few people you know, and of whose details you consistently keep reminding yourself, in case you wind up embarrassing yourself. Now add the fact that people are constantly entering and leaving this party (many characters are around only for a single chapter), and it will be clear that, whilst one or two characters stand out, the vast majority of them aren't around long enough to be properly developed. It's easy to confuse people whose strongest characteristic is their name. Cutting down the characters would have improved this situation. Jin could do with fewer helpful friends and associates, whilst Jake could do with a smaller family: we meet his mother, father, brother, wife, daughter, foster mother, foster father, and two adopted brother figures. That's nine relatives, and whilst they each have a convenient role to play (his biological father, for example, is a resourceful conman, his foster father a sheriff), they could easily have been combined into half that number (couldn't the sheriff be a confidence trickster? Or the confidence trickster fake being a sheriff?). Expanding and amalgamating these roles could easily have lifted these figures from their two-dimensional obscurity. In Mather's defense, the characters aren't the novel's primary focus. But I also have to point out that the similar clamour of plot elements in the latter stages of the novel causes it to become a little unfocused, forcing the reader to work, too, at keeping track of the meandering storyline. This significantly diverges from the simpler structure of earlier chapters, when the AI itself is in control, and its methodology—killing potential threats, for the most part—is clear and entertaining. It's in the retaliation against it that events become muddied. Due to the speed of the near-omnipresent computer opponent, the myriad characters must work simultaneously in order to bring it down: from mimicking various corporate/political identities and faking news reports, to corrupting stock markets, infiltrating board meetings, conducting DDOS attacks, and even creating their own rogue intelligence. In order to keep the reader in suspense, none of these crisis-point actions are foreshadowed, leaving the reader lagging behind the protagonist and his multitudinous companions. Whilst in its earlier stages the novel does a good job of scene-setting in locales varying from Hong Kong to the Mohawk nation, the crowd of plot elements mean that Darknet's later stages jump rapidly from location to location, not always giving a clear description of how the characters came to arrive there. This was more than resolved by the end of the novel, as the myriad threads combine into a satisfying conclusion (the schemes culminating in the global chaos necessary to undermine the AI), but for a while the reader is simply abducted by the novel, and given the feeling of being dragged along for the ride without clear explanation of how, why, or where they're going. It's a disorienting experience. Although Darknet would have benefited from a smaller cast, along with fewer jumps in location and smoother plot developments in its later chapters, it's ultimately held up by the well-researched, inventive worst-case scenarios offered by the AI. The anonymous assassin markets are chilling, as is the ease with which the artificial entity simulates human personalities and finds clever ways of disposing of its flesh-and-blood opponents: from open elevator shafts, to switched medical prescriptions, to gas leaks. It's the AI who's the real star attraction here, as a personification of amoral, unthinking corporate financial institutions, and whose techniques for acquiring monetary gain are inventive and fun. It's just a shame that a sequence of code outshines most of its human counterparts, and as with Atopia and Cyberstorm, these ideas would be better placed alongside stronger personalities. But if you're looking for some hard science fiction fun, Darknet's technological horrors make for an enjoyable (if sometimes disorienting) read which will inform whilst it terrifies. Redfern gained a queer literature Ph.D. from the University of Wales in 2010. Since then his writing has appeared in several newspapers, magazines, and anthologies, with his novel The Giddy Death of the Gays & the Strange Demise of Straights being published by Lethe Press this June. Stalk him at redjon.com.